Believe it or not, the kitchen is not finished yet. 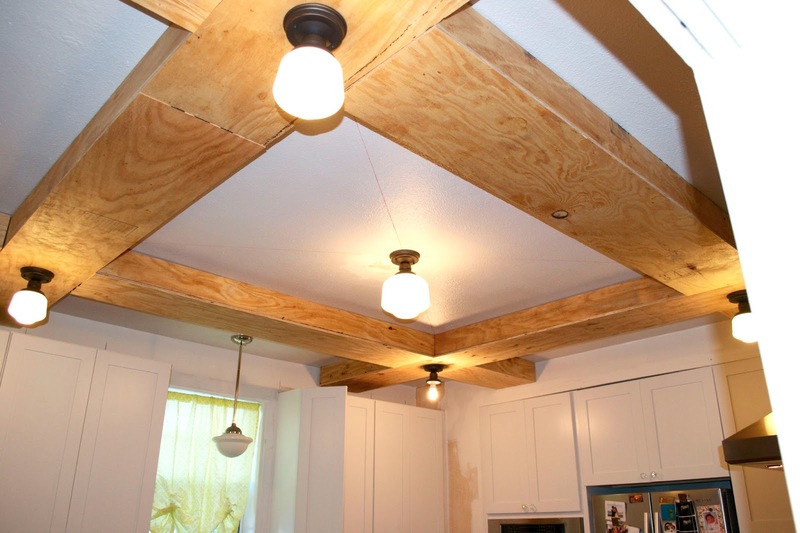 However, all major things are now finished now that we finished installing the beams. It may still look really rough, but to us, getting the last sections of beams up looks amazing. Getting the beams up didn't come without a cost though. Nate hit his head against one of the lights which knocked the shade off. It turns out that while the bamboo floors are pretty soft, they aren't soft enough to prevent a glass shade from shattering when dropped eight feet... now we know. The reason the kitchen isn't finished at this point is because all that is left is finishing touches and this is where we classically peter out. The kitchen is completely usable so there is nothing really pushing us to finish things up. All that we have left to do is a ton of painting and a ton of trim which won't actually take long to do, but I don't see it getting finished until Nate lets me get on a ladder again.